Avada has been the #1 selling theme for more than 4 years, making it the most trusted and complete WordPress theme on the market. Powerful options & tools, unlimited designs, responsive framework and amazing support are the reasons our customers have fallen in love. We are dedicated to providing you with the best experience possible. Read below to find out why the sky’s the limit when using Avada. Avada Is More Than A Theme, It’s A Powerful Design Tool. Avada gives you the ability to build virtually any design style. These professionally designed demos were built entirely with our options and require no custom coding. Every demo is included for free and can be easily imported with one click through the admin. Customize Your Entire Site With Ease, No Coding Experience Required! Take Control of Your Website. Yeah, There’s An Option For That. Avada’s set of features, options and tools make it the most versatile theme on the market by allowing you to take control of virtually every aspect and section of the site. The powerful customization options & features give you flexibility to create the site you want. Fusion Core is our companion plugin that holds a tremendous amount of powerful tools and options. $75 value FREE! Powerful page options offer greater control over each page/post, allowing each one to have their own custom settings. Fusion Builder is an intuitive page builder that provides „what you see is what you get“ drag and drop page building. Over 40 shortcodes along with hundreds of options give you complete control over your content and styling. Avada is fully responsive and adapts to every screen size. We obsessively test it all so your content looks beautiful. Translate Avada into any language, or use one of our dozen included language files. Avada is also fully RTL compatible. Control the overall site width, main content area, single and dual sidebar widths with ease, using pixels or percentage. Avada provides advanced header options like no other theme can. Quickly create the header of your dreams. Multiple menu locations, Fusion Mega Menu with widgets, menu positions, customization options and more. Avada includes Fusion Slider, Revolution Slider, Layer Slider & Elastic slider for easy slide building. $40 value FREE! Avada offers numerous page layouts and options to fit every situation, making it easy to complete your design vision. Choose from 6 different blog layouts and have unlimited blog pages. Oh, and we also include a plethora of blog options. Choose from 12 different portfolio page templates, dozens of options, unlimited portfolio pages and much more. Avada is WooCommerce compatible and offers a unique design. Create & maintain an online shop with ease. Need a forum? No problem, Avada is bbPress compatible and offers a unique design so you can setup a forum with ease. Advanced page title bar allows you unique styles, images, and content globally or per page or post basis. Advanced footer options allow for 1-6 column layouts, and a plethora of various customization options. Use single, dual or no sidebars on any page or post you desire. Easily control the sidebar widths and positions. Avada offers over 10 built-in custom widgets that can be used in sidebars, footer, sliding bar and mega menu. Choose between boxed or wide layout. This can be a global selection for all pages, or single selection per page or post. Unlimited color choices! Color options are provided for each element using an advanced color selection tool. Avada offers advanced typography options that give you full control over the type that displays on your website. Utilize columns all the way from 1 to 6 all throughout the site. And use any combination of those sizes. The beautiful iLightbox is included with your purchase, making your images look stunning. $20 value FREE! Custom image backgrounds can be uploaded to just about any area of the site, and are unlimited. Avada allows you to create one page parallax sites and multi-page sites with ease. Choose one or both! Everyone loves parallax scrolling effects, they are simply beautiful. Avada has advanced parallax options & controls. Avada has a full set of social icons and styling options that allow you to always share your precious content. Avada is built with care allowing search engines to index the content of your site to achieve higher rankings. Avada is optimized for speed. Careful attention to detail and well structured code ensures a smooth experience. We know what it’s like to need support. Our philosophy is to treat you as we would like to be treated. More Avada Features To Love! We know what it’s like to need support. Our philosophy is to treat you as we would like to be treated. With a hands on support center, online documentaiton and HD video tutorials, it’s no wonder that some of our best reviews are about our amazing support. Our support system is the perfect place to receive more detailed instructions on using your theme. Online and easily accessible, these are detailed instructions on how to use Avada. 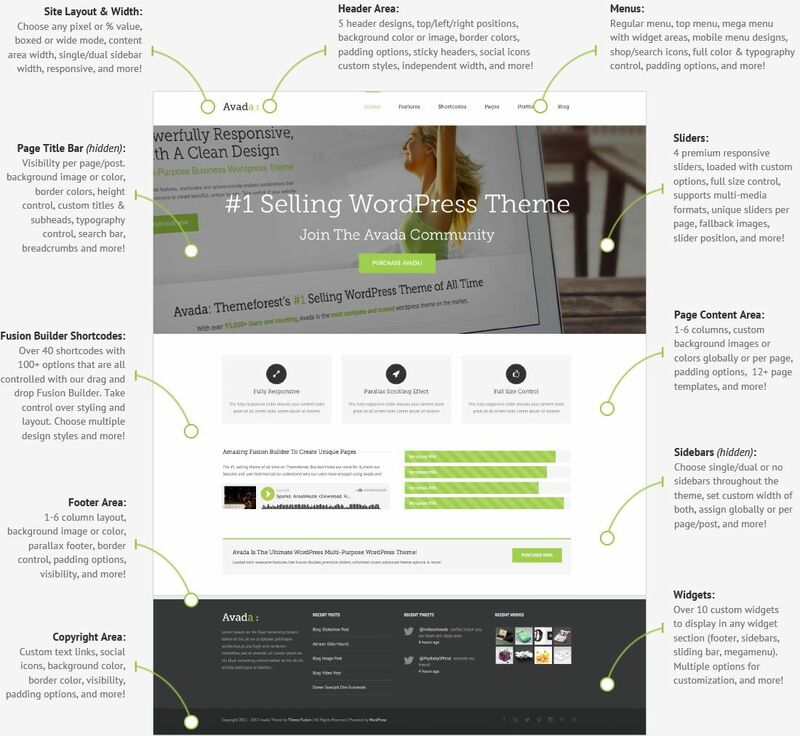 This is the place to find just about anything you need to know about using your theme. Nothing is easier then learning first hand by watching a nicely composed high-definition video. Watch our HD narrated video tutorials to quickly learn how to use various parts of your theme. People everywhere are loving Avada and we thrive off their feedback. With almost 10,000 ratings, Avada maintains an overall 5-Star rating. Current Trending Features In Avada! As you’ve read above, Avada is packed with useful features. These features make it ridiculously easy for anyone to create stunning web sites. Check out below to find out what features are currently trending in our 145,000+ customer base! Full Design Integration & Support For WooCommerce. Avada includes integration for the most popular shop plugin, WooCommerce. Our custom design and unique shop shortcodes will allow your products to shine. Avada + WooCommerce makes it easy to have an online shop. Fusion Builder Provides Drag & Drop Creativity. Visually drag and drop elements to create unique pages using our intuitive Fusion Builder. We include dozens of builder elements called shortcodes, each with their own amazing customization options. Fusion Builder is not only useful, it’s fun. Flexible Layout Options To Fit Each Situation. Avada includes multiple layout options for header, pages, blog and portfolio giving you maximum flexibility for design and setup. Join The 250,000+ Satisfied Avada Users!